5iveby5ive Media Lake Country fire engine 91 was damaged in an accident on Sunday. Dec. 4, 2017 10:49 a.m.
A 23-year-old man from the North Okanagan-Shuswap area has been charged with several offences under the motor vehicle act after nearly striking first responders to an accident scene on Sunday. Police say it’s not clear why the truck ran through what was a closed section of the highway and struck the Lake Country fire engine, narrowly missing an RCMP officer. The charges to the driver of the pickup truck included fines of over $1,100. One of Lake Country’s first-in fire trucks is on the sidelines after being damaged in an incident Sunday that could have been much worse. After attending a single vehicle accident southbound on the new stretch of Highway 97 near Oyama, a Lake Country fire engine stayed behind, closing off two lanes of the three-lane stretch of highway, as RCMP and members of the public remained at the accident scene. 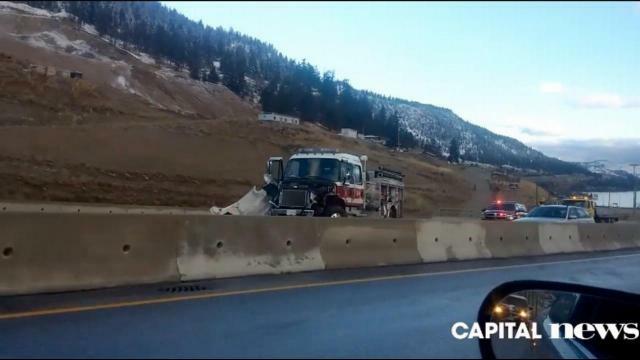 However according to the Lake Country Fire Department, a pick-up truck ignored its members who were doing traffic control and drove through the lanes that were closed, attempting to cut back into the fast lane, near the accident scene. Penner said the truck careened across the highway into the cement barricade and then across the road again, where it struck a car that had come to pick up the original accident victim. The fire department had set up cones and were acting as traffic control within a safety zone to protect the RCMP member as well as members of the public in the accident scene. It was unknown if any charges have been laid against the driver of the pick-up as of the Lake Country Calendar press deadline. We call into the RCMP and will pass on more information as it becomes available.